This entry was posted in Uncategorized and tagged Mott the Hoople. Bookmark the permalink. The “original” (pre-Bad Company) version of Ready for Love off this album is outstanding. So many great songs on this one. Brings back memories. Thanks for that. Of equal importance in the Mott discography were the two that followed this. 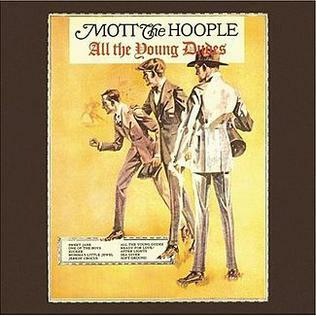 ‘Mott’ and then ‘The Hoople’. Amazing rock records burned into history, with one great cut after the other. I was lucky to see them open for Queen, back in the day. Talk about history. Was it Bowie that influenced Ian Hunter or was it the other way around?! Bowie, Ian Hunter, Mick Ronson:( Woody woodmansey, we were at the birth of something different, our parents were just saying” there all queers” lol you’ll grow up queer my dad used to say” lol I could talk Albright about that era, who I saw and nearly photographed T REX Marc Bolan, I had a Polaroid camera he posed through the glass of the Granada TV the Bolan Show, he sadly died about three days later. If I’d have had a proper camera that image would have made me rich, it would still be selling now.